Ubisoft has announced an $80 Collector’s Edition for Splinter Cell: Conviction, filled with items they say will not be found anywhere else. 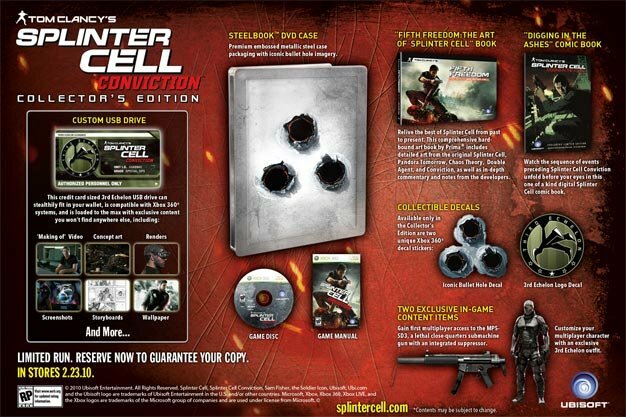 There are all the standard items you’d expect from a CE like a steel case and an art book, but it does come with slightly more unique items like a credit card-sized, 3rd Echelon-branded USB drive for the 360. There are also two exclusive in-game items, one of which is an outfit for a multiplayer character — effectively our first glimpse into the game’s yet to be revealed online mode. Ubisoft urges everyone who wants one to order it asap as they say there’s a “very” limited amount being made. Check the bigger image here to inspect all the stuff up close.